HopeLine reached out to us in the summer of 2018. They asked us to create a fresh, new coffee blend with flaovrs and aroma that would highlight the natural soothing effect of the coffee bean and the power of a You Talk We Listen cup of converstaion. HopeLine has been providing crisis interventions and suicide prevention services via their crisis line since 1970 and recently added the option to text too. We are all so excited about the Grounded in Hope blend and we encourage you to share a cup and your story. We like our connections with friends and fmaily like out coffee, strong! To reach a HopeLine volunteer, you can call or text (919) 231-4525 or (877) 235-4525. For more information about HopeLine services, visit their website www.HopeLine-nc.org. 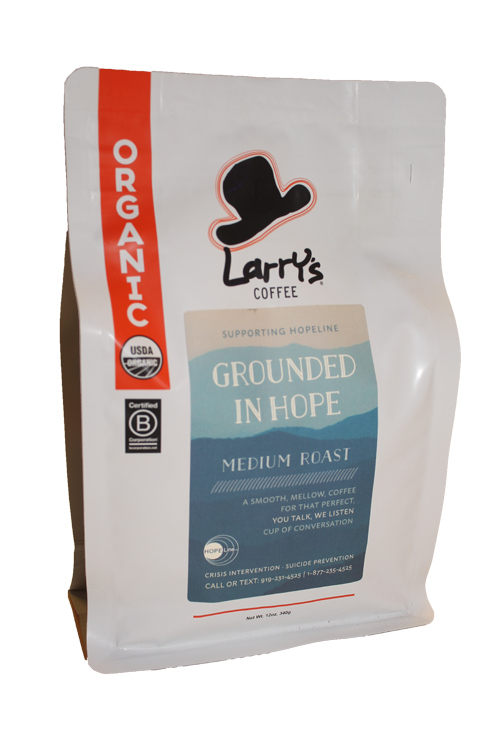 10% of sales of the Grounded in Hope blend goes to help HopeLine provide timely crisis and text line assistance.